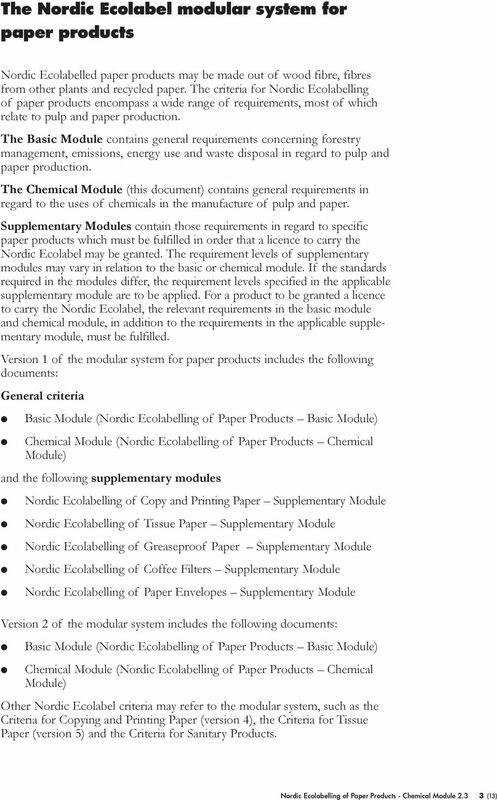 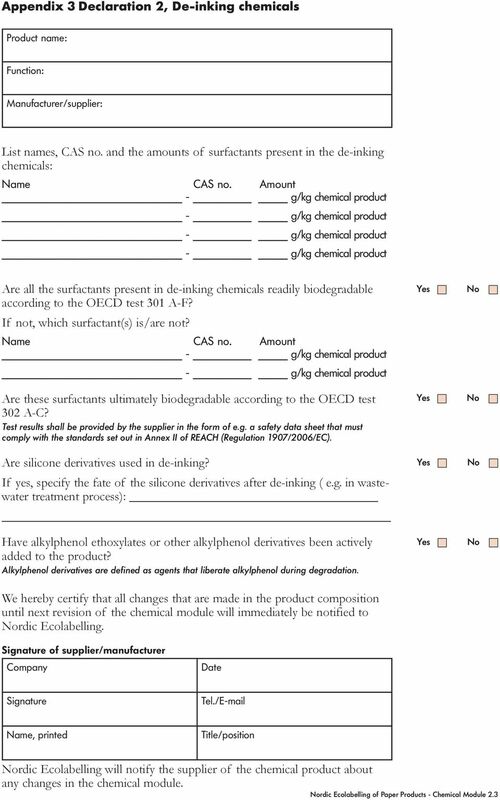 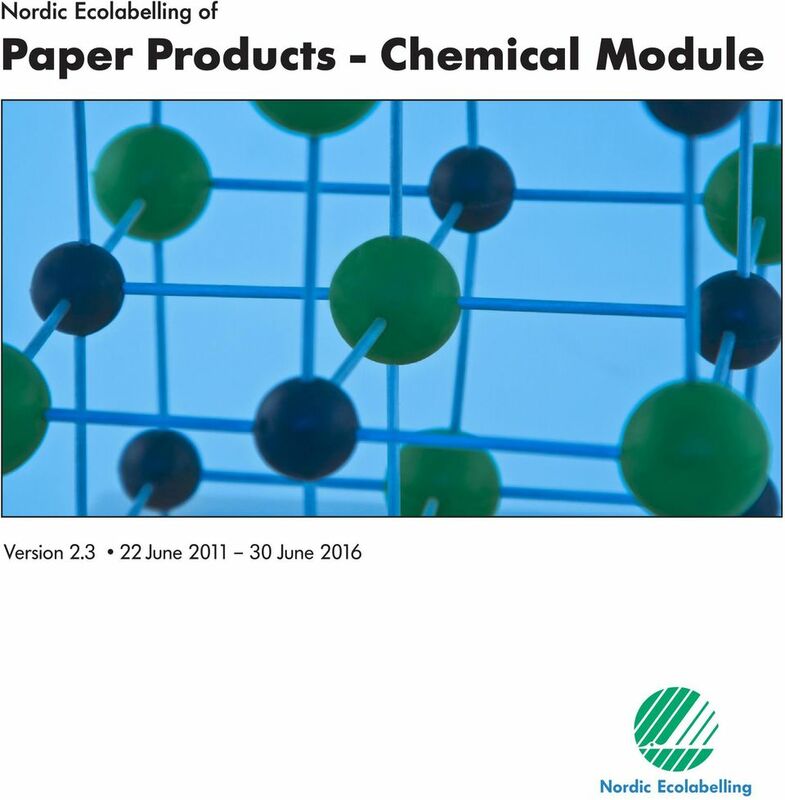 Download "Nordic Ecolabelling of Paper Products - Chemical Module"
2 Content The rdic Ecolabel modular system for paper products 3 What is rdic Ecolabelled paper? 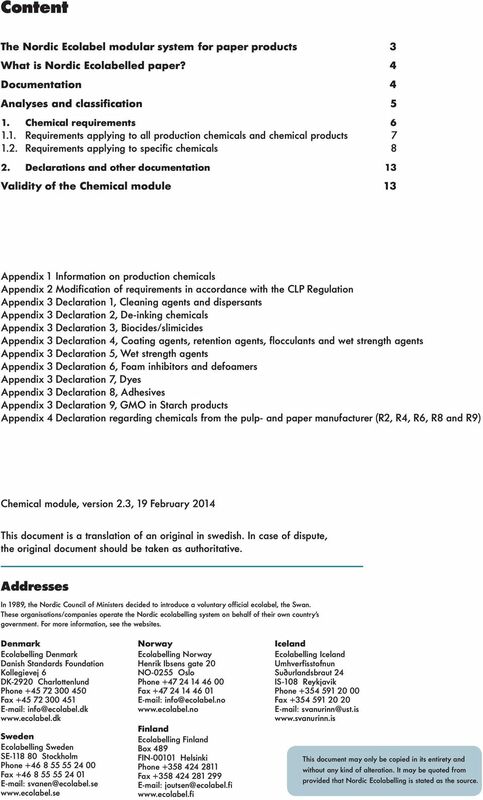 4 Documentation 4 Analyses and classification 5 1. 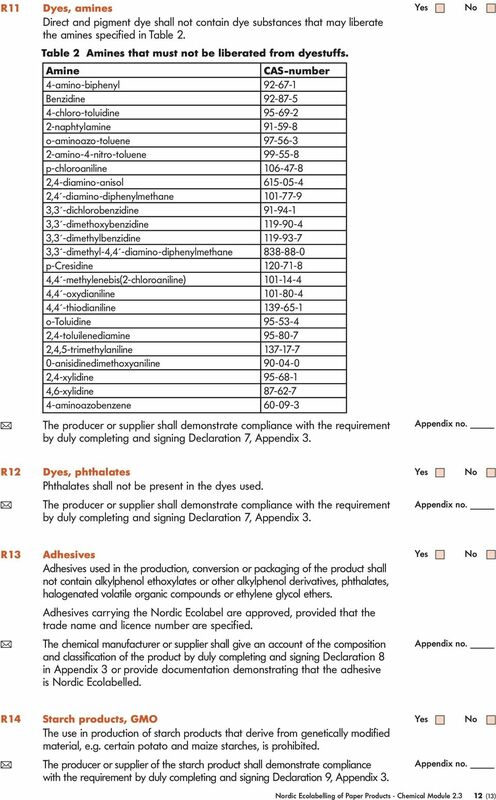 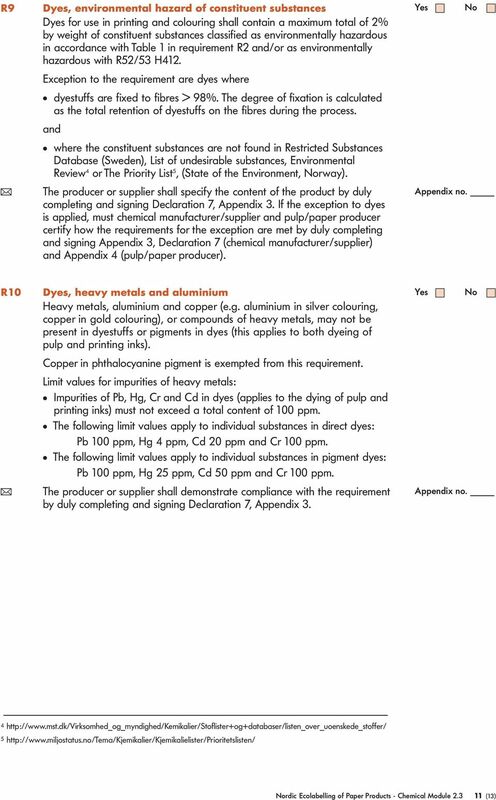 Chemical requirements Requirements applying to all production chemicals and chemical products Requirements applying to specific chemicals 8 2. 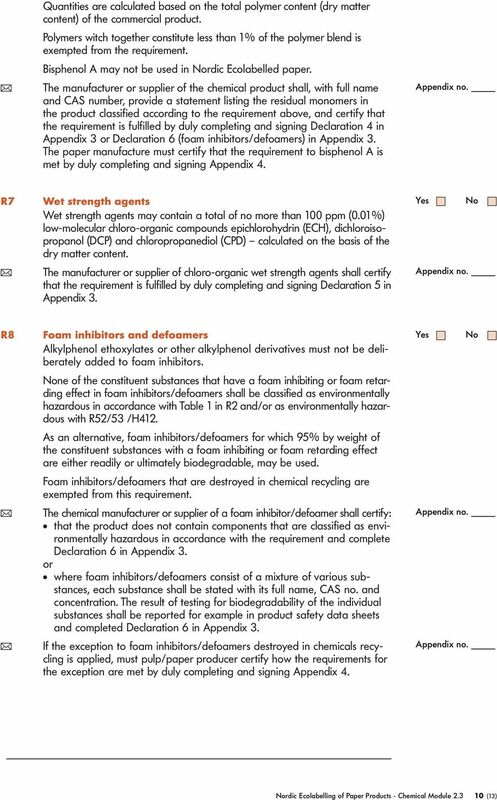 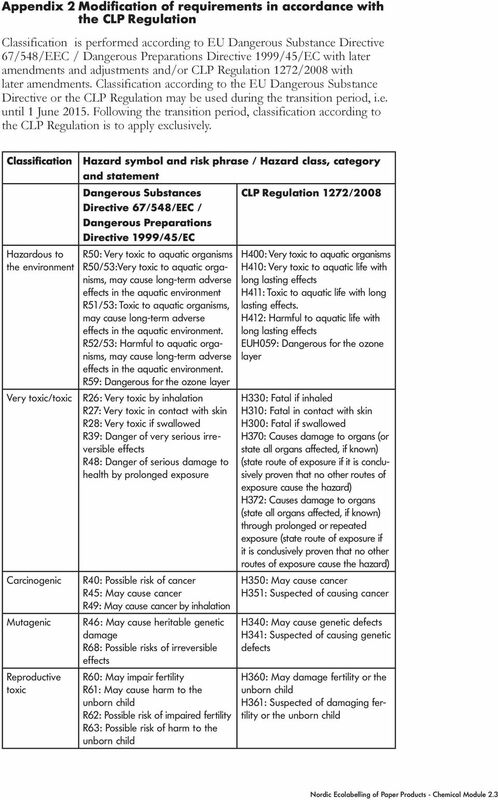 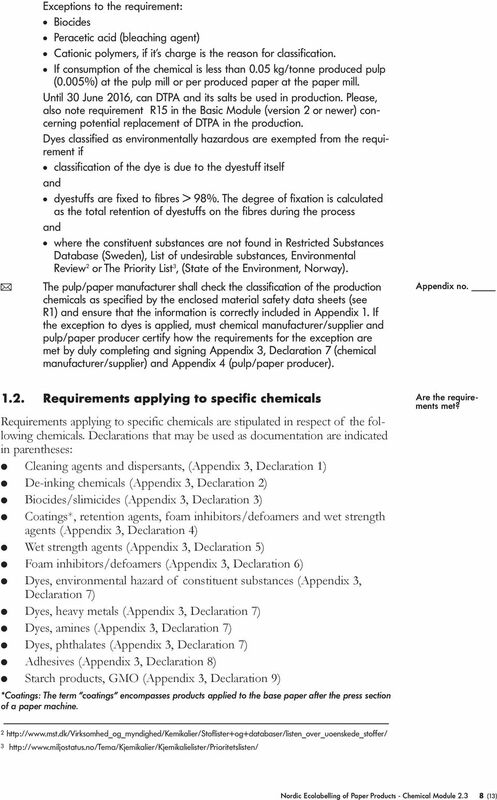 Declarations and other documentation 13 Validity of the Chemical module 13 Appendix 1 Information on production chemicals Appendix 2 Modification of requirements in accordance with the CLP Regulation Appendix 3 Declaration 1, Cleaning agents and dispersants Appendix 3 Declaration 2, De-inking chemicals Appendix 3 Declaration 3, Biocides/slimicides Appendix 3 Declaration 4, Coating agents, retention agents, flocculants and wet strength agents Appendix 3 Declaration 5, Wet strength agents Appendix 3 Declaration 6, Foam inhibitors and defoamers Appendix 3 Declaration 7, Dyes Appendix 3 Declaration 8, Adhesives Appendix 3 Declaration 9, GMO in Starch products Appendix 4 Declaration regarding chemicals from the pulp- and paper manufacturer (R2, R4, R6, R8 and R9) Chemical module, version 2.3, 19 February 2014 This document is a translation of an original in swedish. 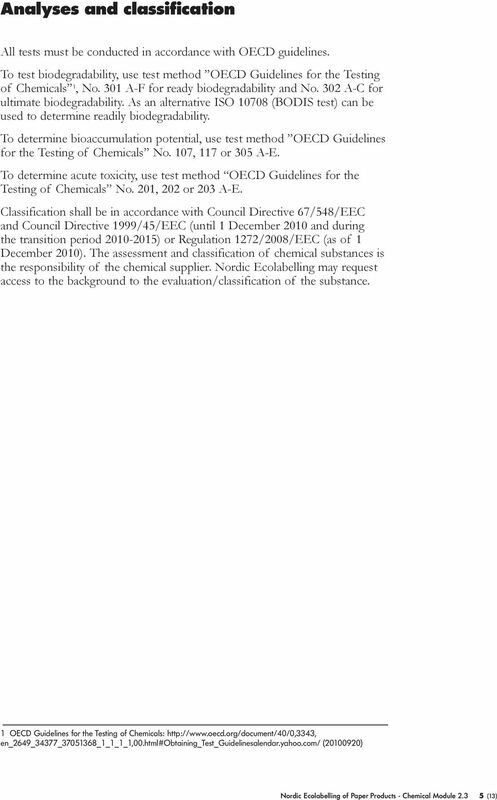 In case of dispute, the original document should be taken as authoritative. 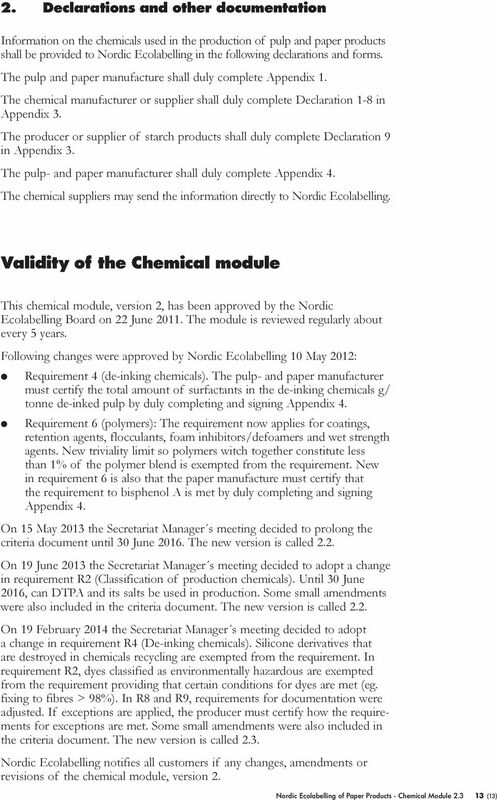 Addresses In 1989, the rdic Council of Ministers decided to introduce a voluntary official ecolabel, the Swan. 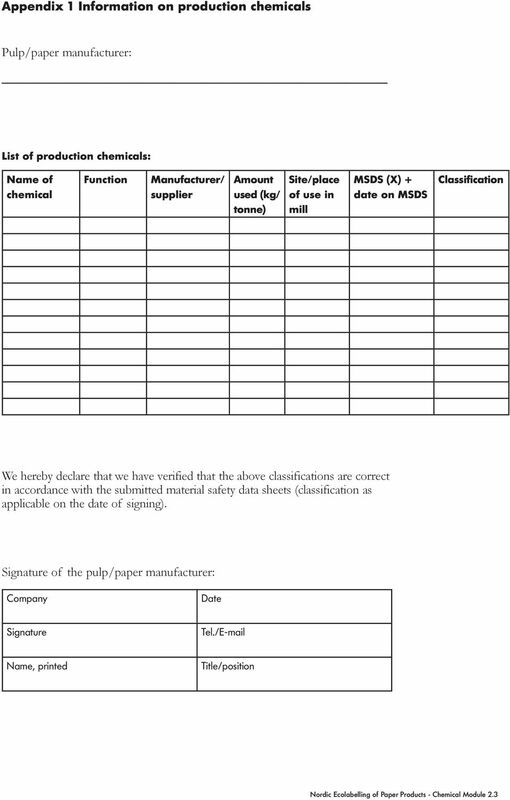 These organisations/companies operate the rdic ecolabelling system on behalf of their own country s government. 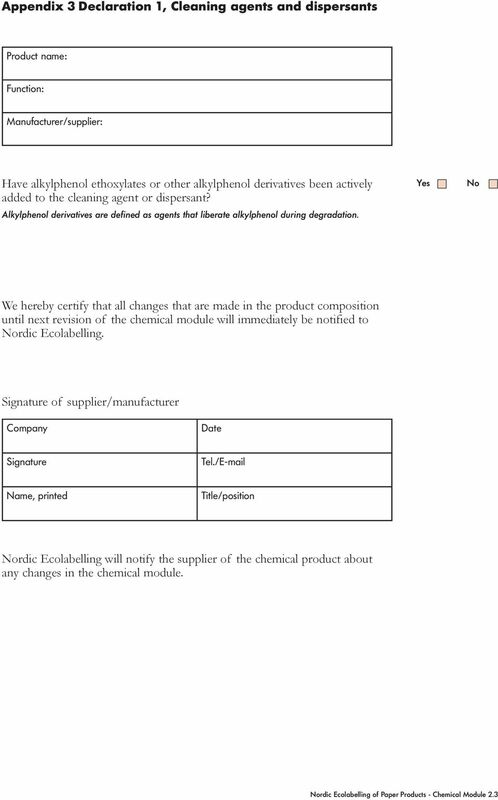 For more information, see the websites. 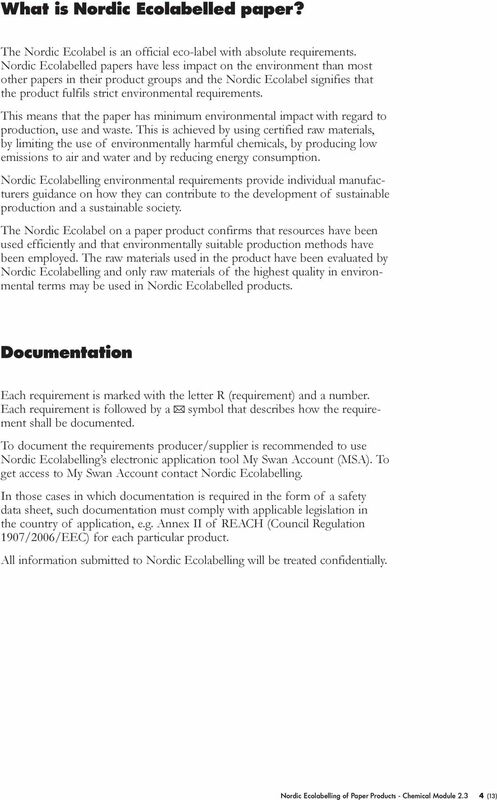 Denmark Ecolabelling Denmark Danish Standards Foundation Kollegievej 6 DK-2920 Charlottenlund Phone Fax Sweden Ecolabelling Sweden SE Stockholm Phone Fax rway Ecolabelling rway Henrik Ibsens gate 20 NO-0255 Oslo Phone Fax Finland Ecolabelling Finland Box 489 FIN Helsinki Phone Fax Iceland Ecolabelling Iceland Umhverfisstofnun Suðurlandsbraut 24 IS-108 Reykjavik Phone Fax This document may only be copied in its entirety and without any kind of alteration. 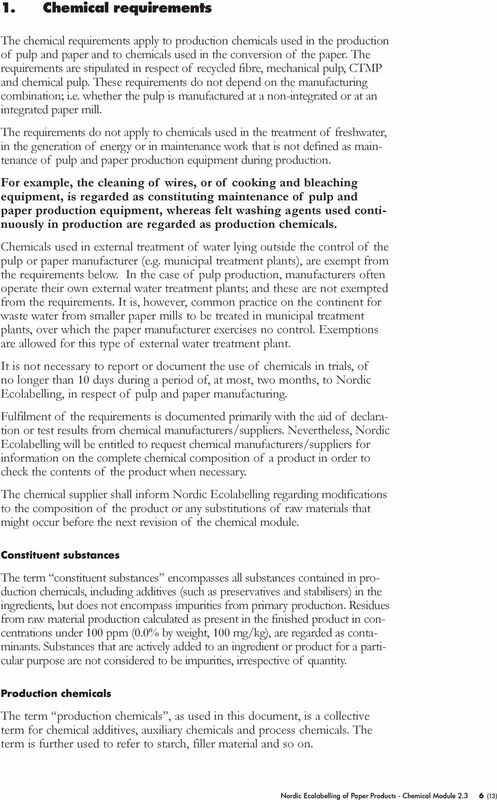 It may be quoted from provided that rdic Ecolabelling is stated as the source. 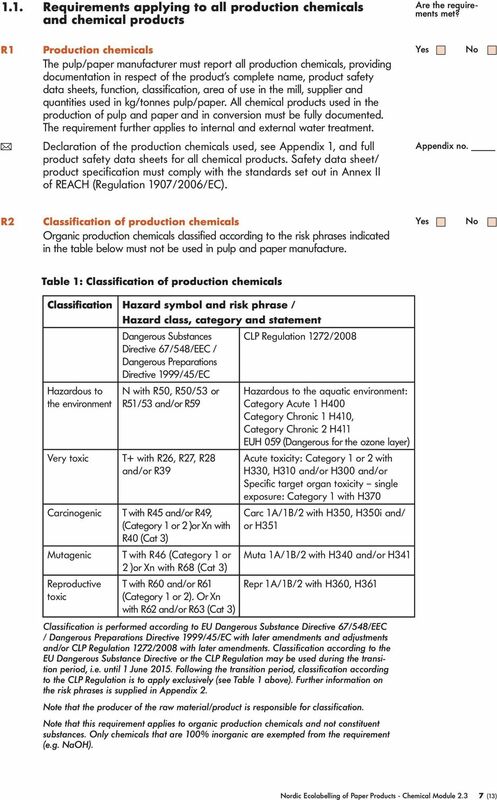 Revision Date 18/06/2010 Revision 1 Supersedes date 18/06/2010 SAFETY DATA SHEET SECTION 1: IDENTIFICATION OF THE SUBSTANCE/MIXTURE AND OF THE COMPANY/UNDERTAKING 1.1. 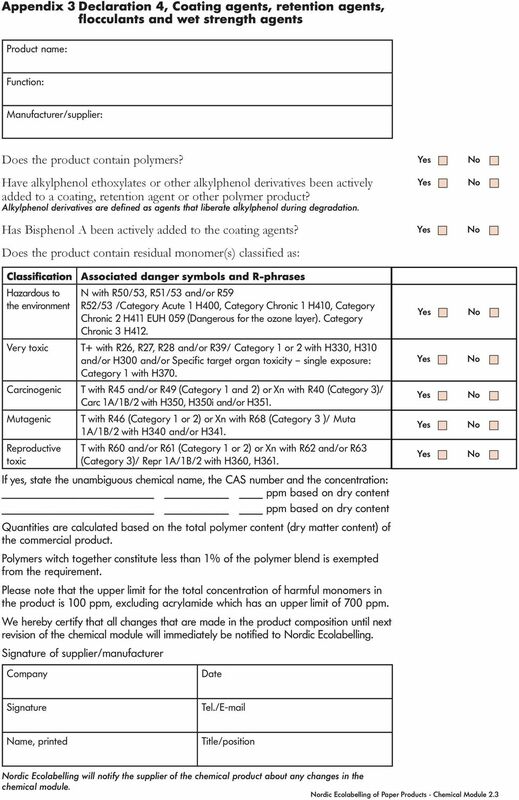 Product identifier Product name 1.2.
rdic Ecolabelling of Car and boat care products Version 5.5 21 March 2012 31 December 2016 rdic Ecolabelling Content What is a rdic Ecolabelled car and boat care product? 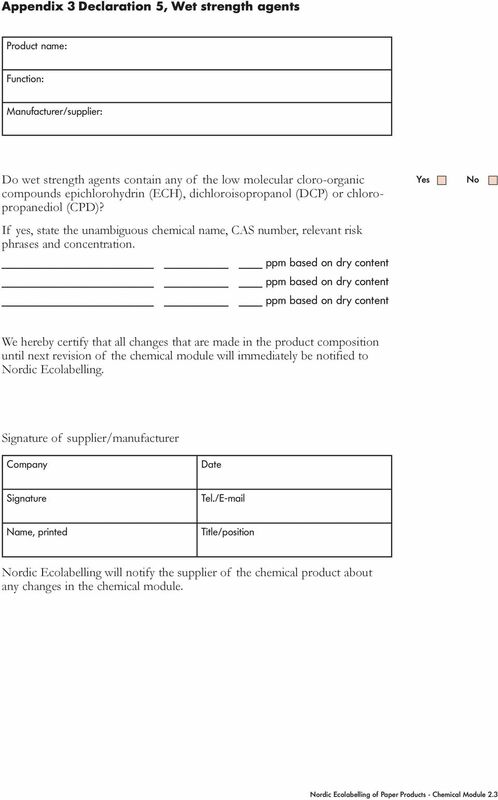 3 Why choose the rdic Ecolabel? 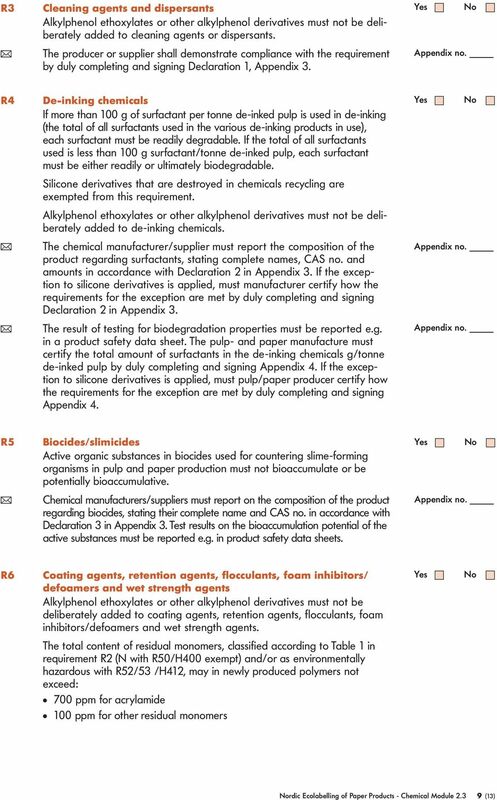 Revision Date 13/07/2011 Revision 5 Supersedes date 13/07/2011 SAFETY DATA SHEET SECTION 1: IDENTIFICATION OF THE SUBSTANCE/MIXTURE AND OF THE COMPANY/UNDERTAKING 1.1. 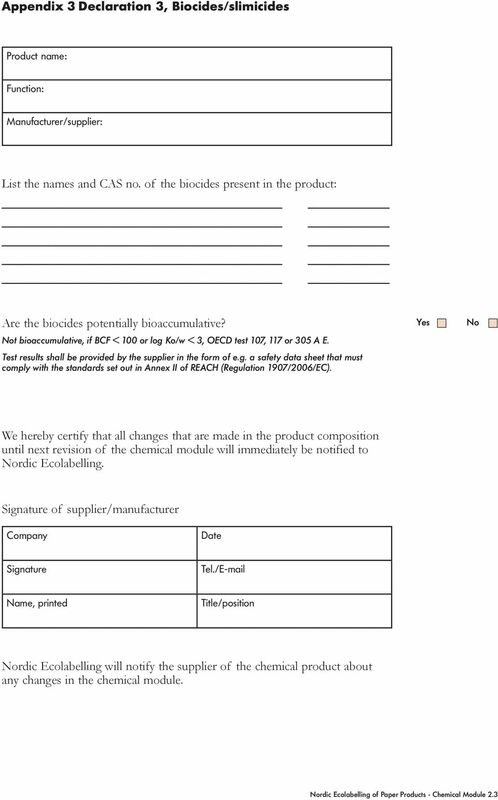 Product identifier Product name 1.2.